Photo by Mollie ShuttWhen it comes to setting the fee to enter a cat in a show, cat clubs must often tread a fine line between charging enough to cover the cost of putting on a show — but not raising the fee so high that it discourages a potential exhibitor from entering the show. It is a delicate balancing act and if the club gets it wrong it can spell disaster to the club's future. In the last few years, exhibitors have seen the fee to enter a cat go from as low as $35 per cat to $50 or higher. On paper, raising the entry fee should mean the club brings in more funds to cover the rising costs of show halls, judge's travel, etc. but this only works if the higher cost doesn't scare away the exhibitors. If the club raises the entry fee by 10%, but 10% of their usual exhibitors decide to stay home because the costs is too high, no one wins. When the cat club decides on their fee schedule for the show, it is short-sighted to simply set higher entry fees to make more money. While the club MAY make more money be raising entry fees, the higher fees may mean the club has FEWER entries. That may result in less money coming in while show expenses remain the same. The club needs to consider whether they might make more money by keeping fees down but attracting MORE ENTRIES. The price of transportation and lodging and the cost of entries, doubles, and groom spaces ALL add to the increase costs of showing cats. When the entry fee is raised, the club may still attract the person with one or two entries, but the added expense may discourage the exhibitor who has 4-6 cats and kittens to enter. When the entry fees were $35, you could enter 3 cats for $105. At $50 each, that number becomes $150, unless the club offers significant discounts for multiple entries. The exhibitor who has multiple cats they could show may choose to either enter fewer cats to keep their costs on budget or may find a different show with a lower entry fee to go to instead. Some of the best and smartest fee schedules have goodies woven in to the fee structure. There is a set fee for one cat, but there is also a discount of some sort for multiple entries from the same owner. A club may also offer discounts for cats or breeds that relate to the theme of the show. For example, the club might offer a discounted entry fee for red, white or blue cats for a show around July 4th, or black cats at Halloween or green-eyed cats at Christmas. 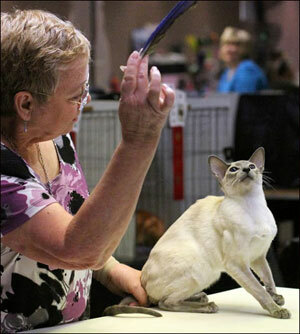 A club could offer a discount for the senior (cat) exhibitor, especially if also offering a veterans class. Consider the exhibitor who can choose between ordering a double cage or entering another cat. 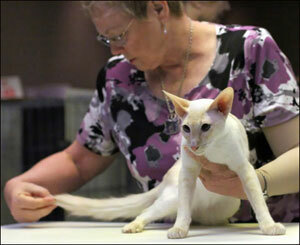 Often, people opt to enter a second cat if it is a local show AND the entry fee is not too high. This way they are contributing to the general count and the additional entry may only cost an additional $20 — assuming, of course, that they would have ordered the double cage if they were only showing one cat. 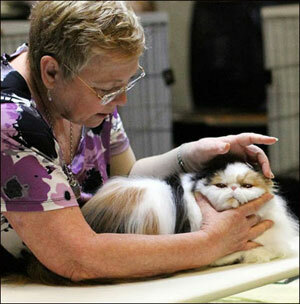 Unless the show hall is small and sure to be crowded, when offering a grooming space, the club should make it a full double space — and point it out on the cat club's flyer. It costs the club nothing to be generous, and making exhibitors more comfortable in the show hall will encourage loyalty that will see them return year after year. If you keep the initial entry fee as low as possible, you may attract new exhibitors who are reluctant to spend a huge amount of money on their new hobby (regardless of their success). Don't forget the potential vendors when structuring a fee schedule. One cat club gave vendors a half-price discount — and attracted more than twice as many vendors for a one-day 6-ring show. Avoid "nickel-&-diming" the exhibitors. Don't charge a fax/e-mail fee for entries. Most of the successful, show-producing clubs make sure that they take advantage of every angle to produce a successful show. A smart, creative fee schedule is the foundation of a well-attended show.